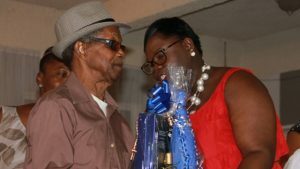 NIA CHARLESTOWN NEVIS (November 06, 2017) — The focus shifted to male seniors, as the Social Services Department, Seniors Division in the Ministry of Social Development singled out five men for their contribution to cultural preservation. The gesture also serves to bring greater awareness to the Seniors Programme. Mr. Clefrin “Shine” Daniel. 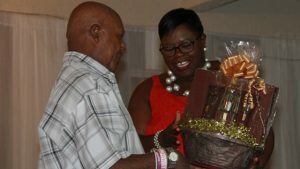 Mr. James Lewis Wilkinson, Mr. Norton Cornelius, Mr. Samuel Freeman and Joseph Elton Archibald were publicly acknowledged and presented with gift baskets by Hon. Hazel Brandy-Williams, Junior Minister in the Ministry of Social Development recently, at a gala awards ceremony at the Occasions Entertainment Arcade. The event was the culmination of a month of activities on Nevis, in observance of the United Nations (UN) International Day of Older Persons on October 1st. “We are honouring five gentlemen … because over the years we are not seeing the participation of the males in our seniors programme and so, we are trying…to encourage the men to support the women as they participate in the seniors programme,” the minister said. 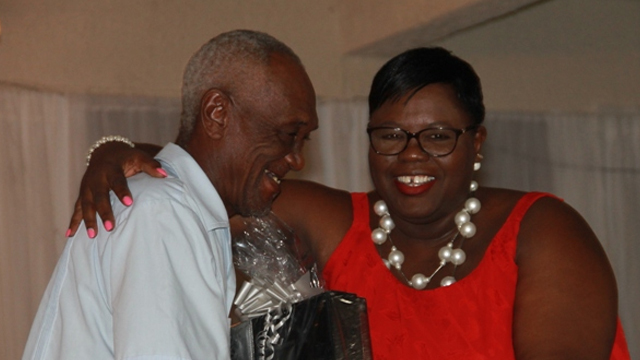 She said it is a fitting way to recognise the men, honour them in a tangible way and to draw the senior men to the programme which is specifically designed for the welfare of seniors on Nevis. The minister expressed the view that all seniors should be treated fairly, respected and allowed to live a dignified life, regardless of their socio-economic conditions. She said it is for those reasons why the Ministry of Social Development through the Social Services Department, Seniors Division continues to laude the honouree’s achievements and to give them their flowers while yet alive.